The Hickory Umbrella Cover from Classic Accessories is made from durable Weather10 material featuring a rugged fabric outer layer with a laminated waterproof and wipe-clean inside coating. Weather Leather trim looks authentic but wont rot. Fits umbrellas up to 11 in diameter. Our durable all-weather protective umbrella covers come in khaki and are crafted from exclusive polyester with double stitching, thick PVC lining, and Durable Zipper.The covers fits Umbrellas up to 11 ft in Diameter which Keep your patio umbrella safe from the elements. Our tough, durable all-weather protective furniture covers are crafted from exclusive Primoguard polyester fabric that's extremely resistant to the elements and will not crack or peel like vinyl. The lightweight polyester material makes installation and removal a breeze. Our all-weather cover features an elastic hem and a spring-loaded draw cord that cinch locks to keep the cover snug and secure. Four sets of ties with Velcro fasteners help to keep the cover in place. This table cover also features a Velcro seam from the center to the edge so you can apply the cover over your table with your umbrella still in place. Just Velcro around the pole and you are all set. Primoguard" covers come with a sewn-inch pouch for easy storage when not in use. Machine washable. 48" Round Table & Chairs w/4 Ties and Velcro Umbrella Closure (84.25" diameter). Available in a Sandstone colour that will attractively match your patio area. Our tough, durable all-weather protective umbrella covers are crafted from exclusive Primoguard polyester fabric that's extremely resistant to the elements and will not crack or peel like vinyl. The lightweight polyester material makes installation and removal a breeze. Our all-weather cover features a durable nylon zipper with covered placket and a draw cord to keep the cover snug and secure. Industrial-strength, double-lock stitched seams provide added long term durability - no loose threads or unravelling over time! Machine washable. Available in a Sandstone colour that will attractively match your patio area. Super strong, lightweight and soft winter covers protect your outdoor furniture from rain, dirt, ice and snow. Tough, durable Gator Weave furniture covers are made from our exclusively designed fabric that are both durable and breathable, water resistant and will not crack or peel like vinyl. Gator Weave covers are also soft so they will not scratch your furniture and features a spring-loaded cinch that locks to keep the covers snug on your furniture all winter long. Our covers come in a neutral champagne colour to attractively match your patio area. Each cover comes with its own storage pouch for easy spring storage. 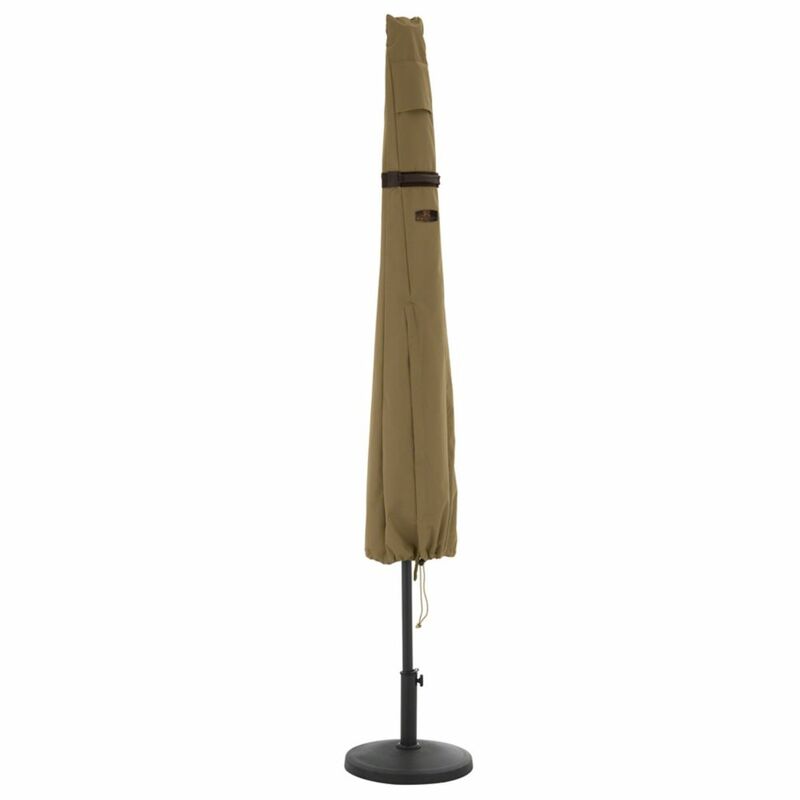 Hickory Patio Umbrella Cover The Hickory Umbrella Cover from Classic Accessories is made from durable Weather10 material featuring a rugged fabric outer layer with a laminated waterproof and wipe-clean inside coating. Weather Leather trim looks authentic but wont rot. Fits umbrellas up to 11 in diameter. Hickory Patio Umbrella Cover is rated 4.3 out of 5 by 6. Rated 5 out of 5 by Dr Thomas from You Get What You Pay For, and Pay For What You Get In the past, we had always purchased the least expensive umbrella cover and which have never stood the test of time. Most of those covers never lasted a full summer (zone 6) without fading, cracking, and/or dry rotting. Those with metal grommets typically rusted and bled onto the fabric. Those products came with either a zero to 30-day warranty and no customer service. We needed a better product. After some research, we discovered Classic Accessories. Yes, they do cost a bit more, but we grew tired of constantly trashing “other brand” umbrella covers on an annual basis over the past decade. As I always say “You Get What You Pay For, and Pay For What You Get”. In this case, we would prefer to pay a bit more to enjoy a better product and better service. PROS 1. We chose the “Hickory” collection covers for our Umbrella and have been satisfied with the heavy fabric quality, stitching, and other features. 2. The padded handle make it much easier to grab when removing. 3. The elastic hem cord has kept the cover on our umbrella. 4. The fabric and colors are far more attractive compared with other lesser quality covers we purchased in the past. 5. You cannot get any better warranty than “lifetime” on materials and construction. 6. Customer service is also superior compared to most retailers. They are product knowledgeable, customer-centric, and responsive to questions and issues. CONS 1. Like any umbrella cover fabric/material, sun can cause fading over time. However, since we bring our umbrella and cover inside over winter, we have experienced negligible fading with this cover after four years. RECOMMENDATION We now only use our Classic Accessories covers Spring through Fall. Over winter, we’ll bring all of our Classic Accessories covers inside. Rated 5 out of 5 by Reversemidasman from Well made and thought out design for this patio umbrella cover. It has many features that makes ... Well made and thought out design for this patio umbrella cover. It has many features that makes for easy put on and off. Has a half length zipper that runs from the bottom up. The zipper also has a decent pull tab on it, and the zipper length is fully covered. At the bottom of the cover there is also a pull cord to so that you can pull it tight together at the bottom end too. On the top end there is a cushion, leatherette vinyl handle that has good cross box stitching for durability. There is also a covered air vent so that there could be some ventilation when in use and not trap moisture so that you don't get that moldy musty smell Otherwise it is made with heavy duty plastic (100% woven polyester with laminated poly vinyl chloride backing. This is made in China, and designed in the USA. Flipping it inside out to see how they treat the stitching, you see that it is single stitched but with a hem strip covering running the entire length of stitching. There is also a limited lifetime warranty on this, but you need to register your product either online or mail in the form that comes with it. Rated 4 out of 5 by Carona from Easy to install Long zipper meant it was easily mounted over my offset umbrella (important for me because I had to do it quickly before the snow that arrived an hour later). Bottom drawstring didn't tighten properly, but it didn't matter because the cover was longer than my umbrella. Rated 4 out of 5 by Drjf from For winter storage only. Not what I wanted IF what you're looking for is a cover to store your umbrella ove the winter this is great. I wanted something to put on and take off easily during heavy wind etc. and this isn't that.